Facebook continues to reign in popularity over other social media channels. As of December 31, 2017, Facebook had 2.13 billion monthly active users (MAUs). Over the years, Facebook has become so much more than just a social network. It has evolved into a platform that connects people will all kinds of brands, media outlets, and content across the web. Facebook currently boasts more than 65 million businesses around the world as active Facebook Business Page users. Out of those, nearly 4 million companies use paid advertising on the social media platform. Still, due to all the noise, most brands fail to maintain a stable online presence on this channel. Recently, however, Facebook came into the limelight for an entirely different reason. The somewhat shocking announcement by Facebook Founder and CEO Mark Zuckerberg detailed the platform’s intention to show less public content (such as posts from businesses, brands, and media) in the news feed and prioritize the updates from friends and family. This recent announcement has taken the entire marketing world by storm. Many marketers are now worried that this new algorithm update will make it much more difficult to reach their consumers. However, as the updates are still being rolled out (first in the US and followed by rest of the world); we are currently sailing in uncharted waters. While business strategies will undoubtedly take a hit, this is NOT the end of the organic content on Facebook. Remember, every cloud has a silver lining. In fact, this update comes with plenty of new opportunities for social media marketers. Here’s how brands can adapt their approach. This tip may seem obvious, but interactive content is going to be the foundation of your revamped social media strategy. Not only should your content encourage interactions, but it should also do so in a positive manner. One of the main reasons for this update was the massive influx of “fake news” and unhealthy discourse. Given these two factors, a significant observation was that Facebook had turned into a negative and stressful environment – something that was a complete contradiction to its original purpose. 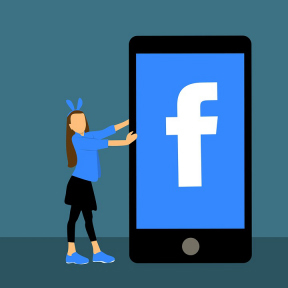 Zuckerberg has explicitly stated that Facebook wants to encourage sharing content that leads to active interaction and make sure Facebook is time well spent. In the coming months, Facebook posts that spark conversation will get priority over the ones with merely a higher number of likes. After all, most Facebook users tend to dislike clickbait content that commonly uses distorted headlines to attract the attention. Facebook has even cracked down on this tactic. This doesn’t explicitly mean digital marketers will have a hard time promoting their content. On the contrary, it gives brands the opportunity to go the extra mile in building meaningful relationships with followers. Though the picture is still not clear, two major areas digital marketers will need to focus on is writing exceptional headlines and creating posts that share authentic stories. The days of using outrageous headlines (like most fake news stories) to make your content viral are behind us. Due to the growing fake news problem, there has been a large influx of programs popping up to help users identify which content is genuine, and which is fake. 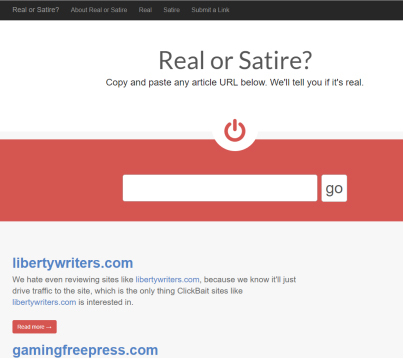 Sites like Real or Satire allow people to enter in the URL of an article or webpage to determine its validity. When crafting your branded content, the headline should be concise, yet descriptive. It should also prompt your target audience to interact positively with your messaging. A great way to achieve this is by asking a question that provokes an engaging response. 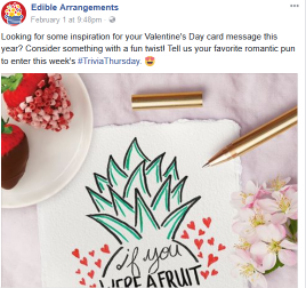 Edible Arrangements has nailed it with several such posts. Sharing customer stories or testimonials is another excellent way to generate conversation on your Facebook page. 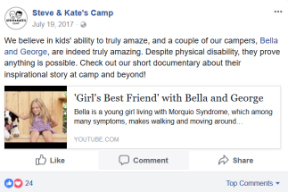 For example, Steve and Kate’s Camp does a fantastic job of sharing real-life stories of their little campers. Sharing this type of personal sentiment not only strengthens your relationship with followers but also positions your brand as a caring entity. Over the last few months, Facebook has been actively empowering Groups. With this update, content from the Groups will get the same priority as the content coming from your friends and family. Thus, localized or targeted content is more likely to get shared, as opposed to generic posts. However, the immense advantage of a group is that it provides more potential for personal engagement. Discussing a topic in a group is less intimidating than talking about it on the business page. Additionally, conversations among groups tend to be more meaningful – as members typically see each other as friends with a common interest, not random strangers on the internet. As you are directly communicating with a targeted audience, your message will receive more attention. However, creating or joining a Facebook group purely for a promotional purpose isn’t going to work anymore. You stand the best chance of generating engagement if you provide non-intrusive value to the group members. 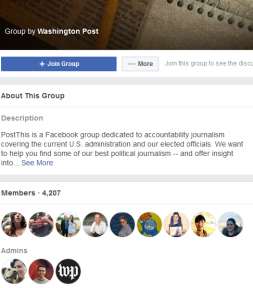 About a year ago, The Washington Post created a Facebook Group called PostThis. The goal was to boost direct engagement between the Post’s journalists and readers. In this group, members can ask reporters how and why they cover stories, emphasizing the value of transparency. Just like this group, yours should focus on a particular subject matter. One of the best ways is to create a group where you can share inspiring tips and posts to educate your target audience further. Think broad. For example, if you run a donut shop, consider starting a group around sharing recipes for baked goods. Post regularly to keep your audience updated about industry trends, news, and developments. You can also host live Q&As, quizzes, and challenges to keep them engaged. Create polls to receive feedback on a topic, product, service, or a piece of content. Do your best to avoid direct promotion. Most of the content you post should be geared towards the top of the sales funnel. It’s no secret that Mark Zuckerberg loves video. He even went on record saying he believes the vast majority of online content will be in video form within the next few years. The beauty of living in today’s state of technology is that any business or individual can go live whenever they want. As the new update focuses on personalized engagement, live video will be the best avenue to get maximum exposure in relatively less time. People comment on Facebook Live videos at 10X rate of regular ones. Keep in mind, when you make a live video, think of it as a way to make a conversation, not as simple means to generate clicks and shares. Usually, AMAs (Ask Me Anything) with guest hosts, behind the scene clips, and videos showing the social side of your brand tend to create the most engagement. Martha Stewart is a leading example of leveraging how-to’s, recipes, and AMA live videos on Facebook. Social Media Examiner has been using live streaming to discuss the latest Facebook algorithm update. As it was a discussion on a trending topic, the live video above generated more than 6,000 shares, 500,000 views, 3,000 likes, and almost 2,000 comments. That’s simply mind-blowing! Another huge advantage is that Facebook will notify your business page’s fans whenever you use Facebook Live. Thus, you can reach your target audience easily and organically. However, whether the current update will affect this feature or not isn’t clear yet. Still, based on Zuckerberg’ love of video, it’s a safe bet that live streaming will ensure maxim publicity for your brand in the future. It will likely take a few months before we can fully understand the newsfeed update and how exactly it leads to further reductions in engagement rates and visibility on Facebook. At this stage, all we know is that the social media platform has recognized the importance of personal engagement and it is likely to make more changes down the road. So, as a social media marketer, there will almost certainly be a period of trial and error to find the best strategies. Do you see this as an opportunity or a setback?